A Death Cafe creates space for an open and relaxed conversation about death and dying. The Death Cafe model aims to shift the conversation around death from one of fear or avoidance to that of familiarity and comfort. Sit around tables of 3-6 people for a confidential, group-directed discussion. Bring your experiences to share; bring your questions to ask. Share only what you are comfortable with—no pressure to tell the details of your personal story. If you have attended in the past you are most welcome to attend again—with new people around the table each time conversation is always different. “Far from being morbid, bleak or despairing, the mood of the event was equal parts sorrowful, uplifting, and caring. The room, at times a din of laughter and passionate story-sharing, was divided into a number of smaller groups, mostly consisting of strangers. We are at a new location! The Penny Whistle Pub at 2 Quebec St, downtown Guelph. Accessible entrance through the double glass doors on Quebec St. Washrooms are on the main floor (washrooms are gender segregated). Closest bus stops are in front of the Library on Paisley, across the street from the library on Norfolk, or in St George's square. Free 2 hour parking is available downtown. We aim to create a space welcoming to all spiritual or religious beliefs or non-beliefs. Welcoming to LGBTQ+ folks. You need to be 19yrs of age or older (sorry for any inconvenience). This event is free. Buying a drink or some food while you're here is a great way to thank Penny Whistle for generously donating the space. Please arrive by 6:45pm to give yourself time to get settled prior to beginning at 7pm. ​This lands holds us, grounds us, teaches us. We gather together in ritual to connect with nature as the season shifts. Give yourself a space of reflection and meditation to touch in to the peace and guidance of the earth, to reflect on the seasons and cycles of your own life. Spring is a time of renewal and fresh starts. Out of the dark of the hibernation of winter, life bursts forth again. Like the seed, like the dawn, spring is a time of great potential, of beginnings. The rest and stillness of the winter is followed by new ideas, fresh inspiration, a sense of awakening. Spring reminds us that we can always begin again. Spring teaches us that before action comes intention and vision. Through meditation, reflective ritual and time to listen to the land we will connect in to our deep selves and connect to the pulse of the season. This earth based spirituality ritual is welcome to all who feel drawn to it--be you a nature lover, a pagan, a witch. All genders and sexualities are welcome. Our space is physically accessible and the planned ritual activities are flexible to suit most mobility needs. Energy exchange is $10 to $20 sliding scale, you decide what to give in that range. Please contact me if this range is a barrier--all are welcome. If you need to pay for childcare in order to attend then you are welcome to pay what you can to attend. Payment can be made at the door with cash or cheque. Ritual will begin promptly at 7pm. Please arrive 10min or so early in order to get settled so that we can start on time. You will have the option of going outside for solo, silent connecting to the land so please wear appropriate outdoor clothing and dress for the weather if you wish. 122 Harris is the Unitarian Congregation of Guelph. Bike lock up spots are available. Accessible via the #4 York road bus. Free parking available in the parking lot and on surrounding streets. Many of us feel like the standard funeral traditions are sorely lacking. Cookie cutter ceremonies that say nothing about the person, that are too often not at all authentic to who they were or what was important to them. Sombre tones that often do not allow for us laugh, remember or celebrate the person. And standard funerals can be quite expensive with a detrimental environmental impact. We're ready to do things differently. Funerals are changing. I can introduce you to your options. 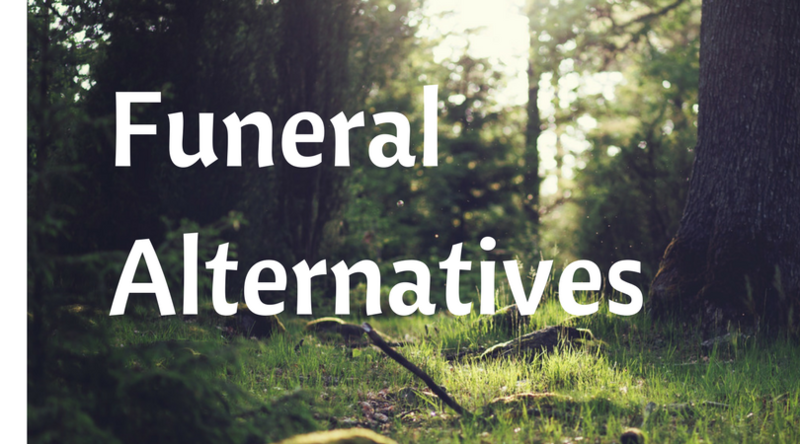 Options like green burial, direct cremation, or newer ideas like composting remains. There are options in ritual and ceremony too. Things like home funerals, outdoor memorials, vibrant and personal Celebration of Life ceremonies. In this workshop I will present to you your options in ceremony and ritual and your current, local burial, cremation and alternative options. We will have time at the end for questions and group discussion. Everyone is welcome to this workshop regardless of age or gender. You can be gathering this information for yourself or to support people around you. Information will be presented from a non-religious perspective and people of all traditions are welcome. Some of the burial and ceremony options may not be applicable or available in your faith tradition--please check with your religious leaders to confirm. The workshop is a welcoming space to LGBTQ+ folks. We will not be covering topics such as wills or finances, power of attorney, or advanced medical directives. Investment is $20. Space is limited so please pre-register through this link to Eventbrite. If this fee is a barrier please contact me--all are welcome. Our location is the Heritage Room on the 2nd floor of the newly renovated 10C Community Space at 42 Carden St, downtown Guelph. Physically accessible space. Bike lock up is available. Accessible by city bus. Free 2 hour parking available on downtown streets. We're diving in to the vulnerable entrepreneurial topics at Fail Night this Thursday, Nov 2, 2017 at 10C in Guelph. I'm one of the panelists for the evening. Laying it all bare. Let's get real together folks. The dominant business culture doesn't prioritize your wellness. Let's write a new story together and do work differently. To be notified directly of upcoming offerings contact me with your email address. 2018 Death Cafe dates will be announced in January. A Death Cafe creates space for an open and relaxed conversation about death and dying over a cup of tea. Event will take place at Red Brick Cafe at 8 Douglas St, downtown Guelph. Red Brick Cafe is a physically accessible space with gender inclusive washrooms. Bike lock up available. Closest bus stops in St George's square. Free 2 hour parking is available downtown. We aim to create a space welcoming to all spiritual or religious beliefs or non-beliefs. This event is free. Please arrive by 6:45pm to give yourself time to get settled prior to beginning at 7pm. This land holds us, grounds us, inspires us and teaches us. We live in a world filled with beauty and chaos. Many of us are feeling stress and anxiety about the state of the world. We need to seek ways to care for ourselves, to get grounded and centred so that we can bring our unique skills and talents to the healing and care of ourselves, each other and our world. Nature is a space we can go to again and again for renewal and grounding. Nature is within each of us. Join us as we gather to celebrate the summer solstice and touch in to the wisdom and peace of the earth. The equinoxes and solstices are touchstones, points of change, opportunities to tune in to the lessons and cycles of nature. We do this personal exploration gathered in community—where we learn from and support each other. The format of the gathering will include individual reflection, meditation, ritual and discussion and include time outside (as individual’s mobility permits them). We will begin promptly at 7pm—please be on time in order to preserve the reflective atmosphere of the space. Led from a non-denominational spiritual perspective that is rooted in the wisdom and lessons of the cycles of nature. Some personal spiritual inspiration is also drawn from my Celtic Pagan ancestry, although this gathering is not specifically Pagan in its ritual practice. This space is welcoming to LGBTQ+ identified folks and the Unitarian Congregation which serves as our location is an affirming congregation to LGBTQ+ communities. All genders welcome. We recognize that for many of us we are on this land because we our settlers. And this land was stolen from its first people’s. The land now known as Guelph is the ancestral home of the Attawandaron/Neutral peoples. We can connect to the healing of this land by listening to and prioritizing the voices of Indigenous communities and supporting the environmental and social justice efforts they have underway. Organized and led by Christine Lafazanos, Life-Cycle Celebrant. As a celebrant I create and officiate handcrafted wedding, funeral and life-cycle ceremonies as well as related workshops and events. Contact me at: christine@woven-threads.ca. Upcoming gatherings are being planned for fall equinox and winter solstice. To be notified directly of those events please send your email address to me or follow Woven Threads on Facebook. The building and washrooms are physically accessible. This is a scent-free event, please refrain from wearing scented products. Please contact me if you have other accessibility needs. Free on-site childcare is available. If you're interested in childcare please contact me directly with the names and ages of the children so that I can ensure I have adequate numbers of care providers available. Located on city bus route #4 York. Bike rack available in building parking lot. Free parking available in the lot or on Harris St or Boult Ave. The Unitarian Congregation of Guelph serves as the location for our gathering yet this event is organized independently (The Guelph Unitarians are an awesome group of spiritual seekers committed to inclusion and environmental and social justice). Through presentation, personal reflection and group discussion we will explore questions such as, "How do I keep my ceremony simple and economical? 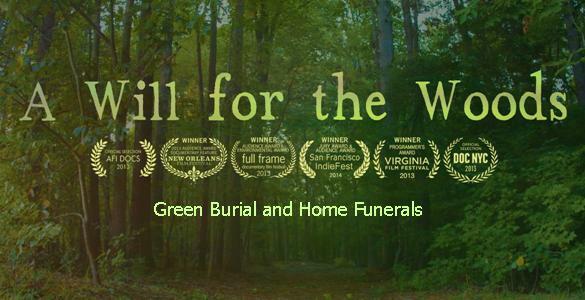 ", "What eco-friendly burial options are available in the Guelph area? ", and "How do I talk to my loved ones about my end-of-life wishes?" Relieve the burden of decision making from your loved ones, save them the worries of “Is this what my loved one would have wanted?” Give them more space to focus on their grief and the other arrangements that need to be taken care of at death. Most of us don’t think about our death very often, but more and more people are recognizing the need to plan for their after-death care -- and they’re wondering how to go about it. Enter local death care advocates Ingrid Ng and Christine Lafazanos, who will walk you through your after-death care options, and help you document your decisions to share with your loved ones. There is a shift happening in the way funerals, memorials, and end-of-life celebrations are done. Many of us are rewriting the rules, and creating new traditions and rituals that speak to us, serve our needs, bring our community together, and are an appropriate fit for the person who has died. Too many of us have stories of attending funeral services that left something to be desired—too many impersonal, cookie-cutter services devoid of the vibrant life of the person whose life is being celebrated and whose loss is being mourned. Instead it’s possible to create ceremonies that are filled with stories, that have room for celebration and laughter, which accurately reflect the beliefs, values and personality of the person who died. Similarly, our options for what happens with our bodies when we die are diversifying and new methods of returning the body to the earth are emerging. Many of us are seeking greener options, and seeking options that are community-based and which involve our families and loved ones. We no longer want to shy away from death and instead can see that healing and celebration are possible when loved ones are directly involved in the care of the body. 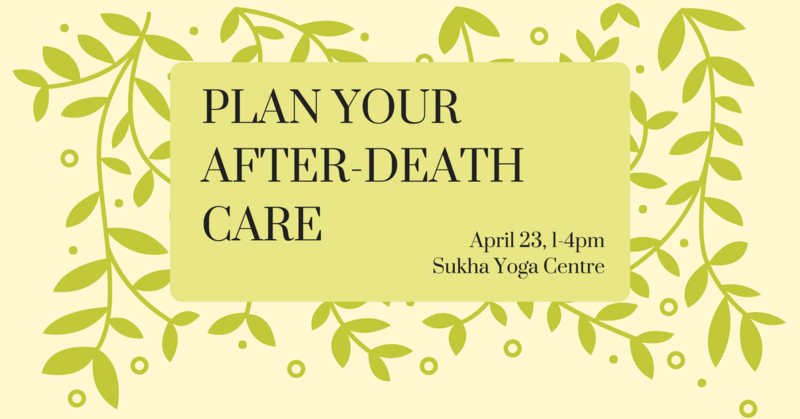 In this workshop you’ll be able to learn from the experience of two local women trained in deathcare. Facilitated by Death Doula Ingrid Ng (beingwithdeath@gmail.com) and Celebrant Christine Lafazanos. Ingrid is a Death Doula and a graduate of the Beyond Yonder Virtual School for Community Deathcaring. She believes that death can be a life-affirming and community-building event, and aims to provide gentle, empowering support to individuals and families in the transition from life to death. Christine is a Celebrant with Woven Threads – Handcrafted Ceremonies where she creates custom, story-filled funeral, wedding and life-cycle ceremonies. Christine is passionate about supporting community members to mark life’s milestones and transitions through meaningful and healing ritual and ceremony. The workshop location is the beautiful Sukha Yoga Centre conveniently located downtown Guelph at 42 Wyndham St N, Unit 103, beside IF footwear in St George’s Square. An open studio space filled with natural light is the calming container for our exploration. Sukha is a physically accessible space with accessible, gender neutral washrooms. This is a scent-free facility so please refrain from wearing perfumes, colognes, or other scented products. Tea and light snacks will be available. Closest bus stops are in St George’s square. Free street parking is available downtown (Cork St and Quebec St are the closest options). The fee for the workshop is $125. A limited number of sliding scale spaces are available; please contact Ingrid at beingwithdeath@gmail.com if you’re interested. Space is limited, we suggest you register early. Pre-register required, sign up via Eventbrite. Contact organizers if you need other payment options (i.e. payment by cheque). This workshop is well suited to adults of any age and any stage of life. Open to all spiritual or religious beliefs or non-beliefs. This space is welcoming to LGBTQ+ folks and people of all genders. This is a death positive space—come prepared for open and direct conversations about death and dying. We do not intend to cover other important aspects of death, such as the following: advanced directives, wills and executor duties; estate planning and financial decisions; and physician-assisted death. These important topics may come up in our discussions; they are not central to the purpose of this workshop. ​This land holds us, grounds us, inspires us and teaches us. The change in season brings an invitation to pause and reflect. To reflect on the season that is ending and review what happened for you, what you are grateful for, and what you are ready to leave behind. Then turn your attention to the season beginning and what intentions you want to set and where you want to invest your energy. We do this personal exploration gathered in community—where we learn from and support each other. The format of the gathering will include individual reflection, meditation, ritual and discussion. If mobility of the group and weather permits we may also spend some time outside. Led from a non-denominational spiritual perspective that is rooted in the wisdom and lessons of the cycles of nature. Some personal spiritual inspiration is also drawn from my Celtic Pagan ancestry, although this gathering is not specifically Pagan in its ritual practice. Organized and led by Christine Lafazanos, Life-Cycle Celebrant. Upcoming gatherings are being planned for summer solstice, fall equinox and winter solstice. To be notified directly of those events please send your email address to me. The building and washrooms are physically accessible. This is a scent-free event, please refrain from wearing scented products. Please contact me if you have other accessibility needs. I am exploring childcare options and an afternoon timeslot for future equinox and solstice gatherings. February 2017 "Back by Popular Demand"
October 2016 "Death Cafe returns: moving from fear and avoidance to openness and comfort"
August 2016 "Death Cafe returns to Guelph"
April 2016 "Talking Openly About Death"
March 2017 article on our Spring Equinox event: "Shed the Weight of Winter and Envision a Springtime of Possibilities"
Featured interview with byron murray on his show "to know the land" where we discussed the Spring Equinox event and the place of nature in ceremony. Scroll down to episode date March 13, 2017. “Moving and inspiring … The film is about a life of purpose and a death with meaning.” Nell Minow, The Huffington Post. Winner of numerous documentary festival audience choice awards. ANAF Vets is a physically accessible space. Closest bus stops 1min away on Gordon St. Free 2 hour parking is available downtown. 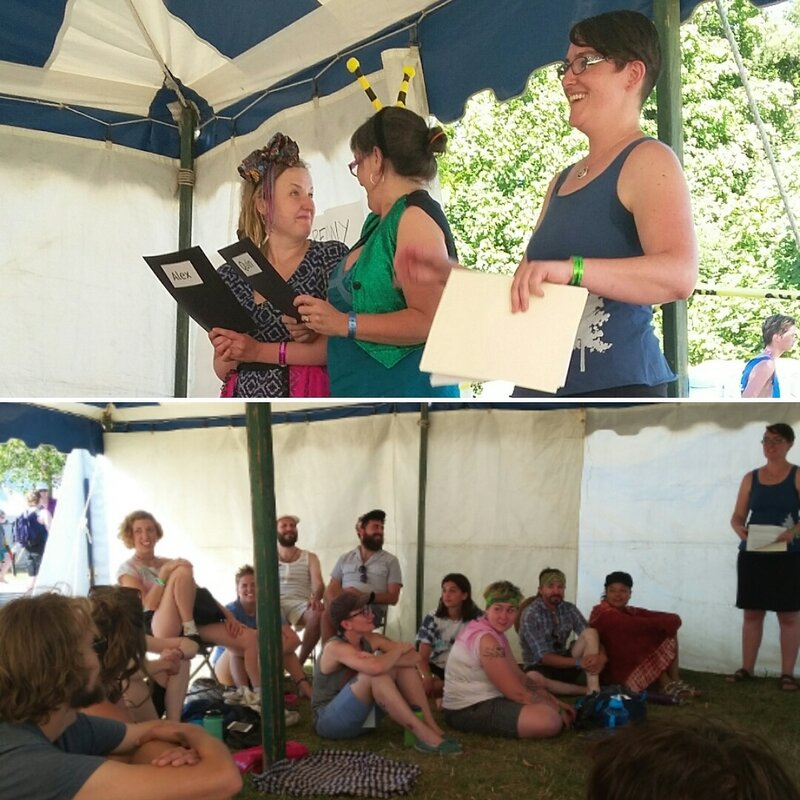 ​At Hillside Community Festival in July 2016 I presented the workshop "The Anti Wedding" to a full tent of enthusiastic folks ready to re-imagine rituals celebrating partnership. Wedding and commitment ceremonies don’t have to be boring and meaningless. With Life-Cycle Celebrant Christine, learn a bit of interesting/kinda creepy history of common secular wedding ceremony traditions and how to keep the wedding-industry monster at bay. Then join a playful, interactive brainstorm of what ritual re-imagined can look like—from the simple to the fantastical (LGBTQ+ and poly-inclusive). 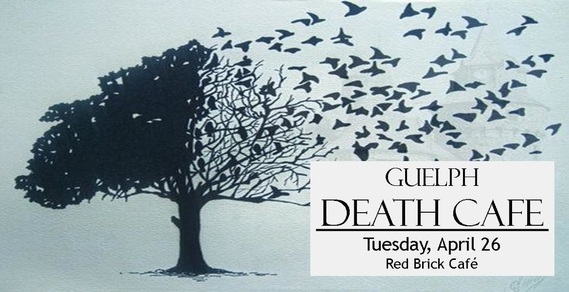 ​Together with Death Midwife Marion Willms (departuresnurse.ca) I will be co-facilitating a Death Cafe on Tuesday, April 26, 2016 from 7pm to 9pm at Red Brick Cafe, 8 Douglas St in downtown Guelph. This event is free. A Death Cafe creates space for an open, relaxed conversation about death and dying over a cup of tea. The Death Cafe model aims to shift the conversation around death from one of fear or avoidance to that of familiarity and comfort. Sit around tables of 3-6 people for a group directed discussion. Bring your questions, share your experiences. Humble thanks to the approximately 50 people who joined the event and shared their stories and experiences to create a vibrant night. Huge appreciation to Red Brick for their kind and accommodating support and work. We were joined by Guelph Today who wrote an article on the event. Quite sincerely, it's an honour to create and hold space for my community to step in to these vulnerable and meaningful conversations. Thank you for joining me. A fun and engaging workshop to examine your personal connections to the rituals and traditions that surround the December holiday season. Release the meanings and traditions which no longer bring you joy and explore the creation of new traditions.